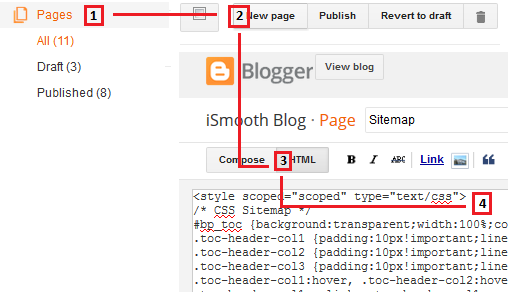 Sitemap is a vital page to be created on any website and not only blogger blogs. So, if you prepare a great organized page that contains all the articles inside your blog, categorized by labels and put them all in one place, you will allow an easy access to your content on the web, not only for search engines like Google, but for any visitor looking to read more of your content. I can guarantee that implementing that archive page will optimize SEO for your blogger blog and make reaching all your stuff much easier for everyone else. Let's not forget that it will make your blog looks more professional. Anyway, lets get started! Navigate to the "Pages" tab. Click on "New Page" to open the HTML editor. Now select HTML tab to put the code. Insert the HTML code given below. Okay, just after you insert the HTML code, your sitemap page is now ready to go live so, go ahead and click on "publish". After that, you will need to include it on your navigation menu or Page List widget. If you do not know how just continue reading the tutorial. Navigate to the "Layout" tab. Click on "Edit" found in the left of your page list widget. Just check the Sitemap's square and click save. 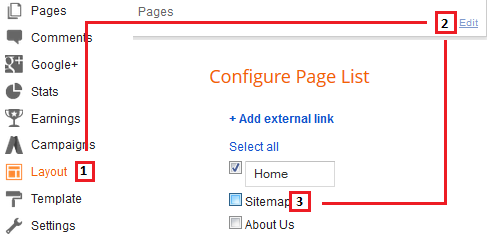 Now you should be able too see the sitemap's link added to your navigation menu, congratulations! However, just in case you have a customized blogger template or navigation menu, it will be different to add the link depending on what you have. 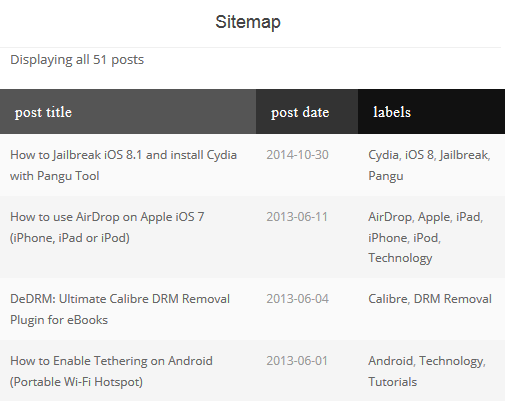 So, what do you think about the Sitemap Archive Page? If you have any thoughts please do not hesitate to write in the comment section below.